Skoda Auto has commissioned Czech glass harpist Petr Spatina to appear in a television commercial playing 597 Schott Zwiesel crystal wine glasses arranged in the shape of a Skoda Superb, the Czech company’s flagship family car. The art of glass harp (glasharfe in German) involves tuning each glass to a different pitch and then running moistened or chalked fingers around the rim of the glasses. “So harmonisch wie nie” translated in English is “Harmony as never before”. 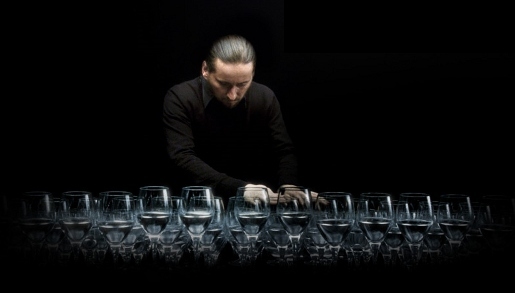 The Glass Harp campaign was developed at Leagas Delaney, Hamburg, by ceative Directors Willy Kaussen, Oliver Grandt, Hermann Waterkamp, copywriter Jan Wiendieck, art director Melanie Mertens, agency producers Barbara Meier, Patrick Plogstedt. Filming was shot by director Ole Peters at Sehsucht, Hamburg, with co-director/compositor Hans Schultheiss, producers Jan Tiller and Stephan Reinsch, director of photography Holger Diener and 3D artist Timo von Wittken. Sound was designed at Hastings Audio Network Hamburg by sound engineer Oscar Meixner.